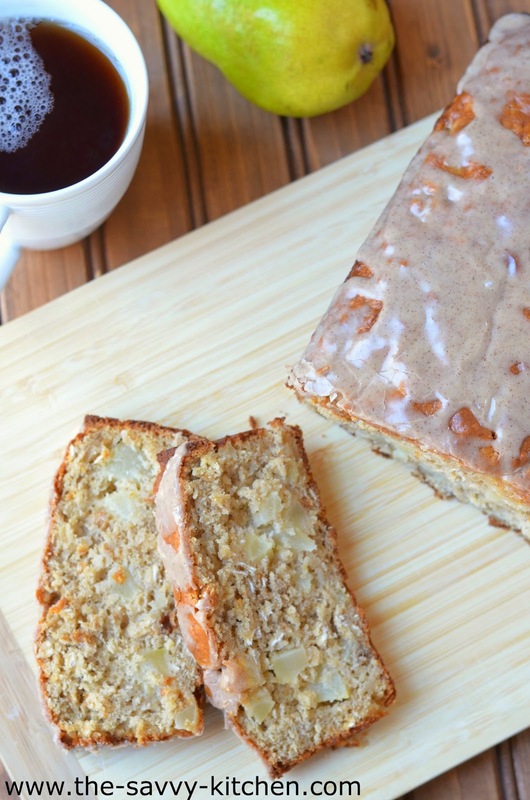 Quick bread is hassle-free and requires little clean-up. This particular version is best served on a cool fall day with a steaming cup of coffee. 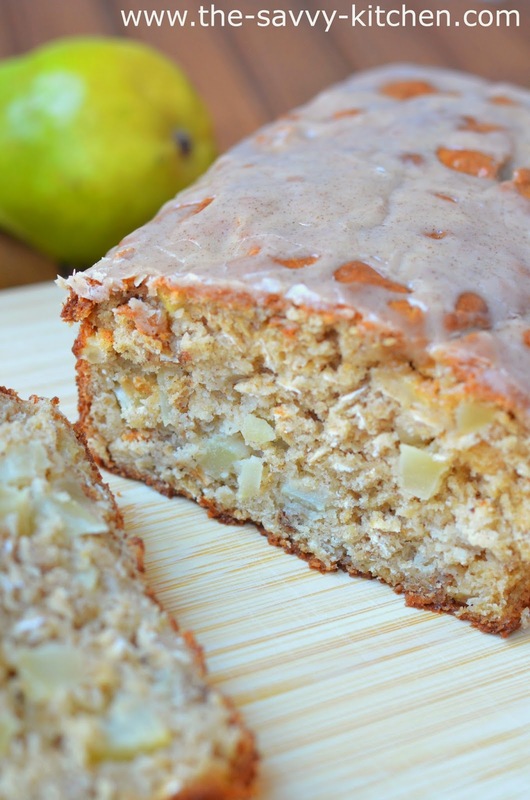 It's perfectly moist and not overly sweet, making it a perfect morning snack. Plus it just screams fall with the pears, cinnamon glaze and apple granola. I love the chunks of pear hidden throughout the bread. They get soft during the baking process, so they melt into each bite. The granola also gets softer, so don't be fooled--there's no crunch in the bread. It just adds a little texture, but it's a welcomed and delicious contrast to the soft bread. The glaze has to be my favorite part, though. It's slightly sweet and has a hint of cinnamon, making it a perfect fall treat. 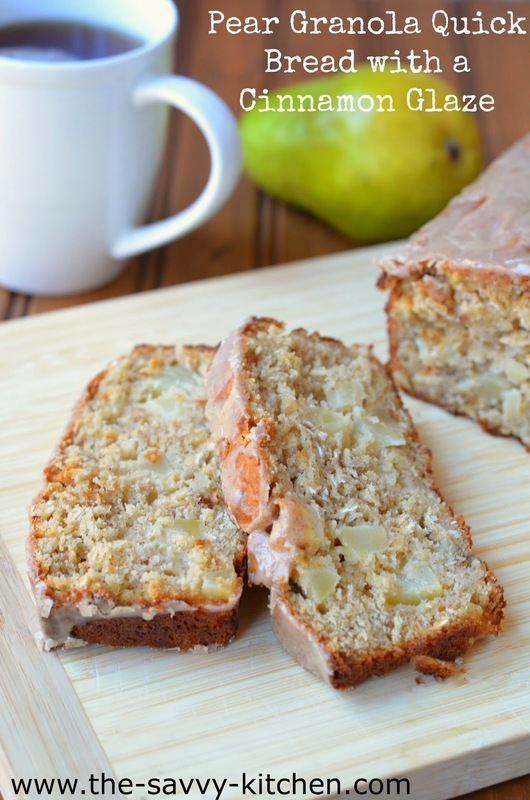 This would be great to enjoy on Thanksgiving morning or as a part of your dessert table. Enjoy! Preheat oven to 350 degrees F and grease a 9x5" loaf pan. Combine the flour, oats, granola, brown sugar, baking powder, salt and spices in a large bowl. In a separate bowl, whisk together the butter, sour cream, eggs and milk. Pour the wet ingredients into the dry and mix until just incorporated. Fold in the pears. Transfer the batter to the loaf pan. Bake for 55-60 minutes until a toothpick inserted comes out dry. Remove from the oven, let cool in the pan for 10-15 minutes before removing to a cooling rack to cool completely. Meanwhile, whisk the glaze ingredients together in a bowl until smooth. Once bread is completely cooled, drizzle the glaze over top of cooled bread. Allow to set before serving.